Parents can appreciate the versatility of a good stroller, and car seat stroller combos can take your infant to toddlerhood with one system. We reviewed a range of the best car seat stroller combo products to help make the buying process a little easier. Not sure what you’re looking for? Our specs list below will help you pay attention to the different features of car seat stroller combos! Capacity: The infant car seat can usually fit newborns and up to 30 pounds before you need to start using the stroller alone. Max. Weight: The stroller usually has a higher weight capacity than the infant car seat, so it grows while your kid grows! Click Connect: A click-connect system lets you know when the car seat is set up properly by “clicking” it into place. Folds: Strollers that fold up are obviously much easier to transport in your car, and tend to be lightweight too. Reclining: A reclining seat can calm a squirmy little one and provide a comfortable naptime option on the go! Item Weight: A lighter combo is easier to transport, but heavier ones can be sturdier and offer more storage space. Now that you know what to look for, it’s time to go over the reviews! The top pick and budget pick cover the best of car seat stroller combos, but the other reviews provide additional options, different features, and different prices. Check them out, too! Our top pick for the best car seat and stroller combo is the Graco Aire3. The car seat fits infants 4-35 pounds and the stroller can hold kids up to 50 pounds. The stroller seat can recline all the way back to a flat position for your child’s comfort and easy diaper changes. A three-wheel design with a suspension system makes the stroller easy to control and gives your passenger a smooth ride! The stroller folds in one hand and automatically locks in the folding position. You can stand it up on its own or use the carrying strap to transport it. The parent’s tray has a zippered storage pocket and cup holders, and a storage basket under the stroller seat provides room for your childcare arsenal. You can switch the harness between three- or five-point. With all of these features, it’s amazing that the system is so lightweight at under 30 pounds! The best car seat and stroller combo for parents on a budget: the Baby Trend EZ Ride! The car seat fits babies 5-30 pounds and up to 30’’, while the stroller fits kids up to 50 pounds. An included removable soft head support can be attached to the car seat or stroller. The stroller has a multi-position reclining seat and can be folded with one hand for easy storage and transport. You can adjust the stroller handle to a few different height options to suit parents tall and small! A large storage basket, child tray, and covered parent tray with cup holders provide the all-too-necessary storage space. The child tray swings out of the way for getting your child in and out of the stroller easily. The padded five-point harness keeps the kiddo secure and comfortable, too! The large canopy shields the rider from the sun, but has a peekaboo window so you can check in on them. The Evenflo Vive stroller car seat combo is available in teal, pink, or blue color schemes. The Embrace rear-facing car seat fits babies 4-35 pounds, while the Vive stroller can safely hold kids up to 50 pounds. The stroller folds up into a slim 16’’ width for easy transitions from the car to the street. You can adjust the seat to different reclining positions and a transitional three- or five-point harness to keep your child comfortable. Other comfort features include a large canopy with a full sun visor--and a peek-a-boo window for you to check in on the little one! A child tray, parent tray, and under-seat storage basket all provide room for you to carry the necessities. The 13’’ EVA wheels have front-wheel suspension to provide a smooth ride on a range of terrains. 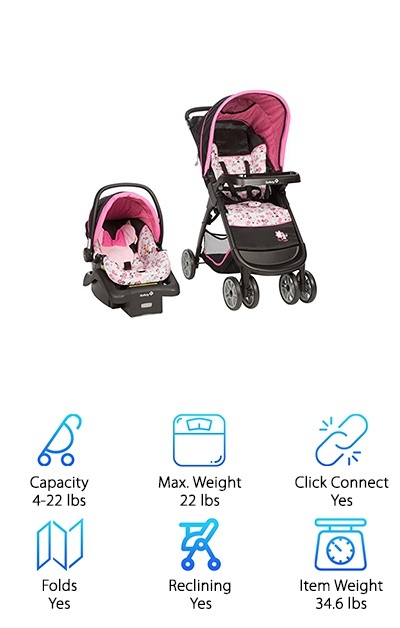 Get a smooth ride with this lightweight car seat stroller combo that fits easily in cars large and small! The Graco Comfy Cruiser system includes a Graco SnuGride rear-facing car seat, car seat base, and stroller. Using the ClickConnect system, you’ll know by the “click” sound when you have the seat in the right position. The car seat can be set into the stroller facing towards or away from the parent pushing the stroller. The SnugRide car seat is a good fit for babies up to 32’’ and 4-30 pounds. The stroller can be folded up one-handed and stands on its own, and has locking front-swivel wheels for jogging or maneuvering crowded sidewalks. The wheel suspension keeps bumps in the road from jostling the kiddo! The seat can be reclined to multiple different positions, and has a convertible three- or-five-point harness. A child’s tray with cup holder gives the baby a place to play, while a parent’s tray and storage basket give you the space you need. Start your child’s love of all things Disney early with a Disney-themed car seat stroller combo! Unhook the rear-facing infant car seat and set into the stroller--listen for the QuickClick to know it’s in place. The car seat fits newborns and infants 4-22 pounds with adjustable harness straps. The car seat base is adjustable too. With one easy motion, you can lift and fold the stroller with little effort! The lightweight stroller features a storage basket under the seat and a parent tray with two cup holders and a storage area. The stroller seat reclines as well for napping on the go. Need a light and cute way to transport your kiddo? This Disney-themed travel system is perfect! 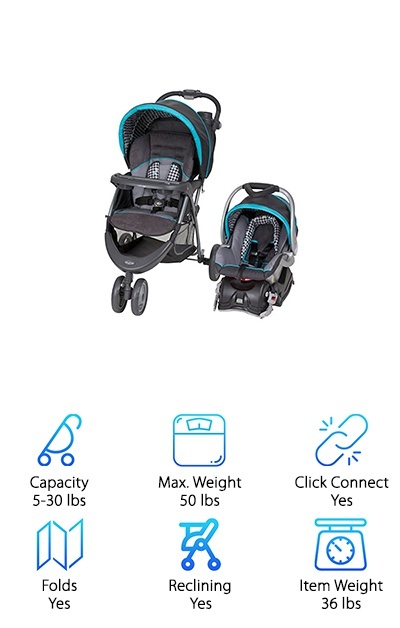 It doesn’t have as high of a max weight as some of our other favorites, but it’s lightweight enough that it’s easy on new parents’ arms and shoulders! 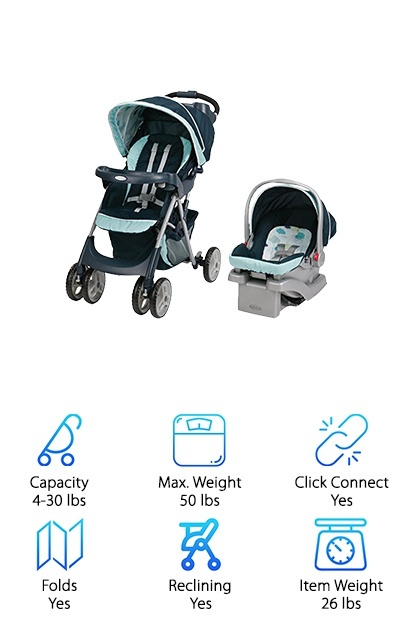 The Baby Trend Nexton Travel System features a sturdy three-wheel stroller and comfortable Flex-Loc infant car seat and base. You can adjust the car seat base to four different heights and fits little ones up to 30 pounds. The five-point harness and three-tier adjustable canopy ensure your child is safe and comfortable! The stroller reclines and is also height-adjustable, plus it has two rear brakes. This keeps your kid comfortable and you in control of the stroller! A child tray, parent tray, and under-seat basket give you plenty of room to store drinks, toys, diapers, and everything else. The stroller is also designed to be folded one-handed for all of those busy parents out there juggling multiple things at once. A removable soft padded head support also comes with the car seat to help support a baby’s head. Install the car seat with LATCH clips or your car’s seat belt depending on what you have available. 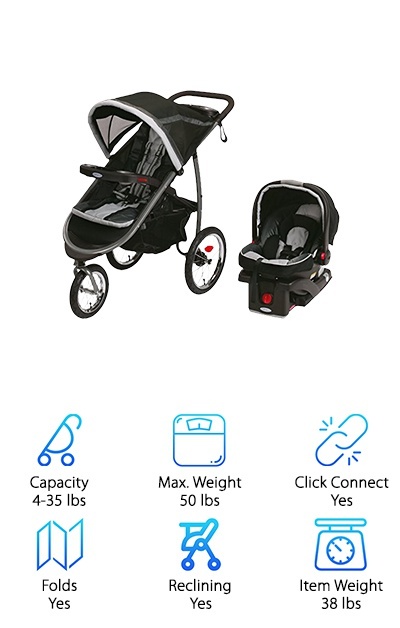 If you’re looking for a car seat and stroller set for jogging, check out the Graco Fastaction Jogger! The stroller features air-filled rubber tires and a lockable front wheel ideal for jogging without wobbling or bouncing. 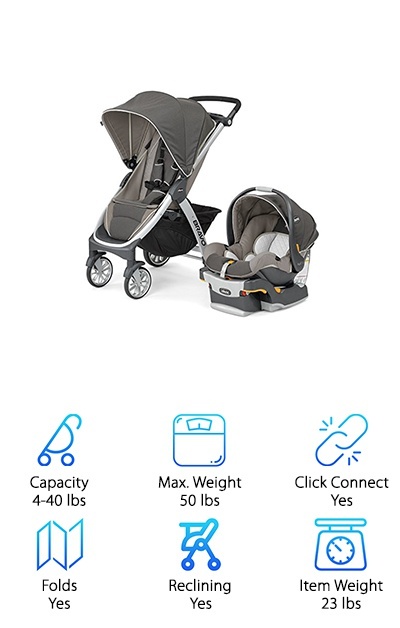 The Graco Snug Ride Click Connect car seat is rear-facing and fits infants 4-35 pounds, while the stroller fits kids up to 50 pounds. The stroller has a pivoting child’s tray with cupholders that you can move out of the way for easy access to the stroller seat. The large under-seat storage basket fits diapers, snacks, and more. Plus, the parent tray on the back has a smartphone cradle as well as two deep cupholders. The reclining seat and large adjustable canopy help to keep your child comfortable throughout the day. You can also fold up the stroller with one hand thanks to a handle built into the stroller seat! For convenience and comfort, the Graco Fastaction Jogger is a great choice. This black and gray stroller system comes with a range of accent colors, including red, blue, teal, orange, and pink! 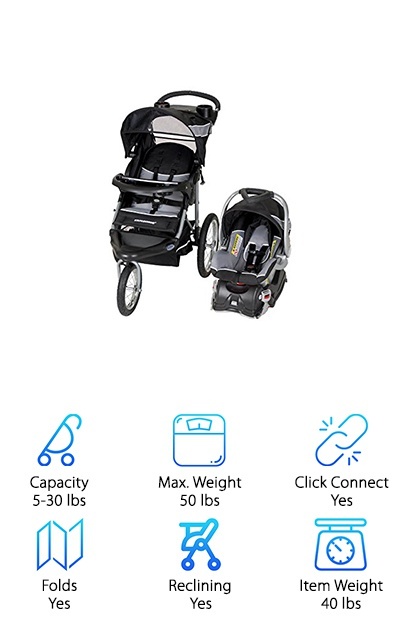 The stroller fits children from birth to 50 pounds and up to 42’’ tall, while the rear-facing car seat fits children 5-22 pounds and up to 28.5’’. Both the car seat and stroller have secure five-point safety harnesses. The stroller also has multi-position reclining for total comfort while traveling. The 12’’ front all-terrain bicycle tires swivel for easy jogging or strolling, while the 16’’ rear wheels help absorb bumps. An adjustable canopy keeps the little one protected from bright sun during day trips, too. The car seat straps into the stroller frame, and then you can transition to the regular stroller seat as your child grows. The Flex Lock car seat design makes it easy to set the seat securely in place and also remove it when you arrive. 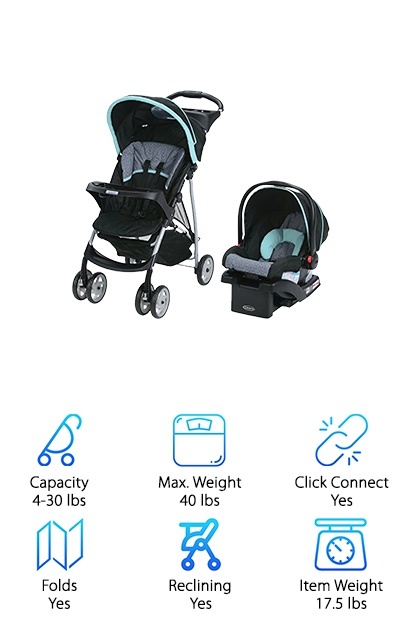 The Chicco Bravo Trio car seat stroller combo is available in teal/gray, green/gray, dotted gray, plain gray, and gray/beige color schemes. 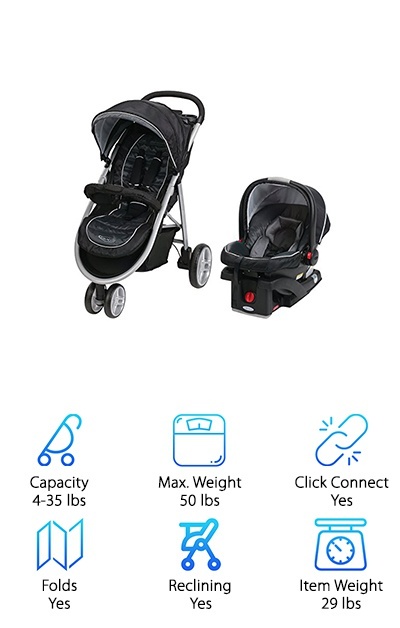 This combo system uses KeyFit rather than Click Connect but is a similar system that “clicks” when you’ve attached the seat to the car seat or stroller correctly. The stroller features a multi-position reclining seat and XL canopy for total kiddo comfort and all-wheel suspension for a smooth ride. On the parent’s end, you get a parent tray with storage and cup holders, plus a height-adjustable handle for pushing. The stroller folds up and stands on its own thanks to wheels that swivel in automatically when you start the folding process. The car seat can be used with the stroller for small children, and you can switch to using the stroller and included base when your child outgrows it. From baby to toddler, the Bravo Trio can get you through it! The Graco LiteRider is a complete travel system that makes life easier for parents on the go. 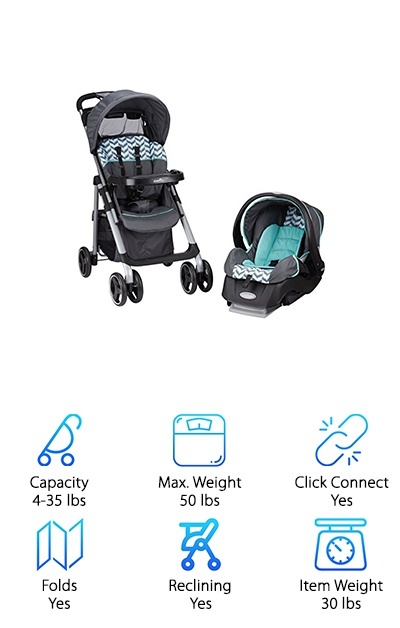 The Click Connect 30 infant car seat is a rear-facing seat designed to fit children 4-30 pounds and up to 30’’. The LiteRider stroller is lightweight but full-featured, with built-in suspension and lockable front-swivel wheels. The seat can be set to a recline position for naptime, and the child’s tray with cup holder pivots out of the way, so getting your child in and out of the stroller is easier. 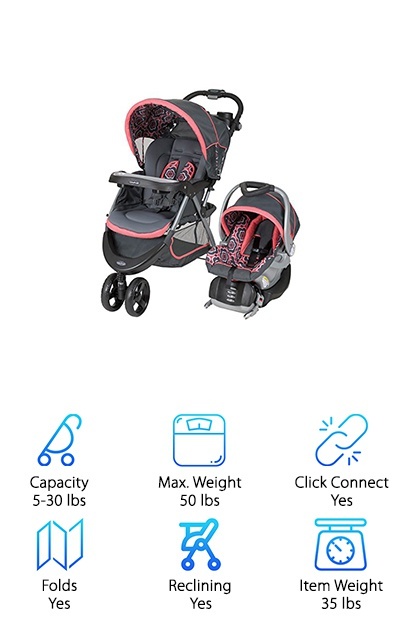 The stroller also has a parent’s cupholder and under-seat storage for carrying everything you need for the outing and your sanity! The car seat has a harness that can be converted to a three-point or five-point for your child’s comfort as they grow. A canopy keeps the little bambino shaded from the sun, but you can check in on them any time with the built-in peekaboo window!